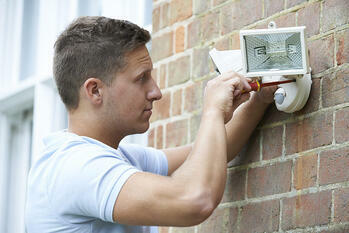 Outdoor motion sensor lights are a relatively easy and inexpensive way to prevent a break-in. There should be enough lights installed so that if there is a disturbance, you’ll be alerted as soon as possible, regardless of where they are entering. You can even buy lights that are equipped with solar power, eliminating the need to change batteries or light bulbs. It only takes one person watching where you hide your spare key to make you a potential target. Instead of storing a spare key outdoors, entrust a friend or neighbor with one. If you must store your keys outside, put them in a box with a combination lock. Make sure everyone in the house has a key to avoid keys getting lost in an exchange. If you are going on a lengthy vacation, ask a neighbor or friend to make sure the front of your home remains tidy. Nothing says ‘the owner isn’t home, come on in’ than an overstuffed mailbox or a porch littered with newspapers. It also helps to make it look like people are coming and going from the home. This can be done by setting lights to timers so they turn on and off throughout the day. You can also ask someone to move cars around if they are parked in front of the home. It’s easy to become complacent when it comes to locking your home. You live in a nice neighborhood and trust all of your neighbors. However, according to Nationwide Insurance, about 30% of home burglaries are classified as “unlawful entry.” This means the intruder was able to enter the home without using force, such as an unlocked door or window. Make it a habit to lock everything before leaving the house, even if it’s for a short time. Don’t forget about that pet door as well. It’s a great entry point for potential thieves. While an alarm system is probably the most obvious on the list, it’s also one of the most effective. For a cheaper solution, many hardware stores sell individual window and door alarms. They don’t notify the police, but the intruder doesn’t know that and the noise may be enough to scare them away. As a last resort, place a sign in your yard that states you have an alarm system. Exclusively for credit union members like you, the TruStage Home Insurance Program provides affordable top-quality protection for your home. This valuable coverage can help you protect your family's home and personal belongings. You'll also have access to outstanding online and 24/7 claim services.